The kids will love recreating days out at the zoo with this Playmobil Family Fun Aquarium Enclosure 9063. There are endless hours of fun to be had with this aquarium enclosure. Suitable from age 4 and upwards, this playset is bound to delight. 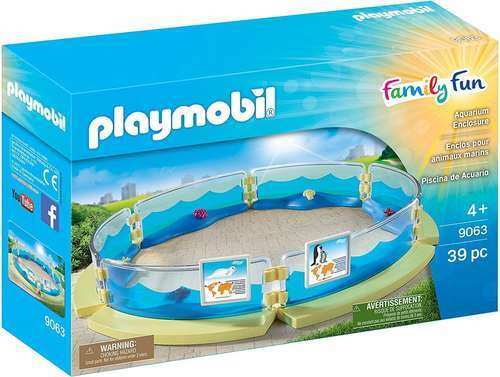 This playset features an aquarium which can be built into a circle by fixing the six included barriers together. Each barrier has a board to display, featuring pictures and information about different animals around the world. Once the aquarium is built up, the pool has a diameter of approximately 26cm. The overall dimensions of the playset being 29.5 x 29.5 x 4.5cm. Children will love playing zookeeper and looking after their favourite animal within the enclosure. Made with transparent pool elements that form a circle with connecting parts. The aquarium really feels as if there is water inside and will inspire children in their play. The pieces of coral that can be attached to the barriers also help to provide a realistic backdrop to keep kids entertained. Children will love being able to play imaginatively with their favourite animals whilst being able to see all the action through the barriers of the pool. This set is an addition to the Family Fun range and works well with any of these products. Children could built themselves an entire zoo or use the aquarium as a stand-alone item. There are also spare parts available should you ever need them, this is a product with durability that will last.